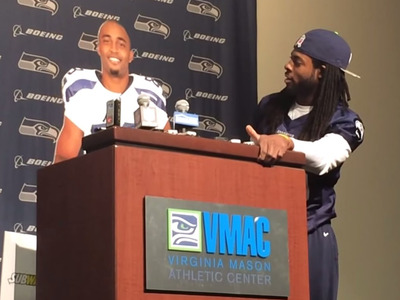 Seattle Seahawks cornerback Richard Sherman criticised the NFL on topics ranging from player safety to the league’s media policy on Tuesday — and he did it with a comedy routine. Sherman brought out a cardboard cut out of teammate Doug Baldwin and held a one-way conversation with it for two minutes. It could have easily come off as incredibly corny and self-indulgent, but he actually pulled it off and touched on some serious problems he has with the league. The Seahawks play the 49ers on Thursday — four days after they played the Cardinals.